Recently, Malyalam actor Mohanlal announced a two-part cinematic adaptation of M T Vasudevan Nair's Randamoozham, a retelling of the fifth Veda, Mahabharata, from the perspective of Bhima. Bhima, indeed, is one of the unsung heroes of all times. He always played the secondary role to his weak elder brother Dharma (in terms of state affairs) and glorious younger brother Arjuna (in terms of warfare). But it was him, who slained a hundred Kauravas for Draupadi. It was him, who sacrificed his son to save his brother Arjuna. Yet, no one really reciprocated the love and respect to Bhima. They always saw him as a well-built, strong-headed, emotionless warrior, who just there to fulfill your wishes. I, personally, fell in love with Bhima, when I first saw the play "Karambhumi" by Kshtij Theatre Group. It was on this play, I discovered the human side of Bhima, but even on this play, his character was not justified, maybe because he is also playing a secondary role there. This blog post is dedicated to Bhima, in order to show my respect for his verities. Hope, this post will also help you to know more about him. 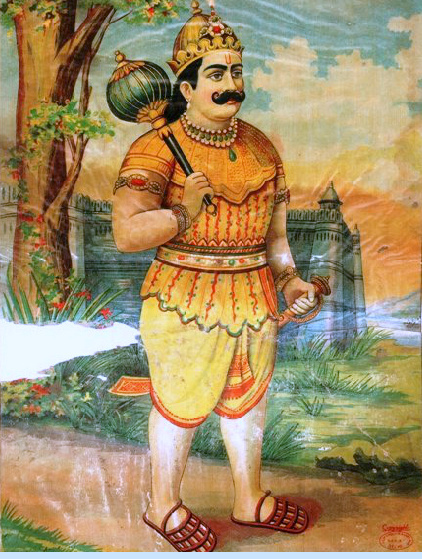 The name Bhimasena comes from two Sanskrit words. First, Bhima which means the 'formidable' or 'terrible' and second, Sena which means the army. Thus the two words give his name meaning, "one who has a formidable army" or "one who is like a terrible army". As Kunti gave birth to Bhima by invoking Vayu, the god of winds. Thus he became to be known as Vayuputra. Bhima is also known as Vrikodara as he had a great appetite, and he was unable to resist food. It is said that half of the Pandava's ration quota was reserved for him. He is one of the best mace-holders of his times, second only to Balarama. Though he cheated to beat Duryodhana, but he does so to fulfill the wish of Draupadi as Duryodhana signaled Draupadi to sit on his thighs when in the Game of Dice, Yudhisthira lost everything including Draupadi to him. It is also said, it was necessary to overcome Duryodhana as he received a boon of Vraja-Sharir from his mother Gandhari's lifetime tapa. One who defeated Jarasandha, the king of Magadha. It is said, Bhima had a fierce fight (mala-yuddha) with Jarsandha, and the fight continued for fourteen days. 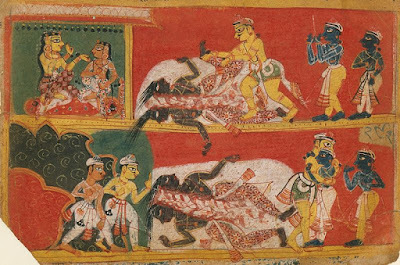 It is on the fourteenth day of the fight, Bhima broke the Jarasandha ribs and ripped apart his body in two pieces. After Lakshagraha episode, during their escapade, Kunti and five Pandavas met Hidimba, a forest dweller. Hidimba is a cannibal and on smelling the scent of Pandavas, he plans to kill them. As he tried to execute his plan and kill sleeping Pandavas, he received fierce resistance from Bhima, who was awake at that time, and in that process, Bhima killed Hidimba and became to be known as Hidimbabhed. Later, Bhima married Hidimba's sister Pallavi (also known as Hidimbi) and had a son, Ghatotkacha. During their thirteenth year of exile, Pandavas have to live secretly, without disclosing their identity to anyone. In that secret exile year, they lived in the Matsya Kingdom, ruled by the King Virata. But Virata was a weak king and lived under the shadow of his commander-in-chief Kichaka. Though Kichaka was a great warrior but he was immoral and womanizer. He tried to woo Draupadi (who was serving as the female servant in King Virata's palace) but he failed. One day, overcame by his lust, he tried to molest Draupadi but she somehow saves herself. She complained the incident to Yudhisthira and asked him to take the revenge for her honor. Yudhisthira refused the plea and asks her to forget the incidence, in order to maintain their secrecy. But now more enraged Draupadi complains the incidence to Bhima, who in turn kills the Kichaka with his two bare hands. And this is how he became the Kichakajit. As mentioned earlier, during the thirteenth year of the exile, Pandavas have to maintain their secrecy, otherwise, they have to spend thirteen more years in the exile, and the cycle continues on, till they have not completed their secret exile year successfully. During this thirteenth year, all five Pandavas and Draupadi adopted a secret identity and lived in the palace of Virata, the King of Matsya. So, Bhima became Ballava the cook, Yudhisthira became Kank the Brahmin, Arjuna became Brihannala the Music and Dance teacher, Nakula became Granthika the horse keeper, Sahadeva became Tantipala the cowherd, and Draupadi became Malini the Sairandhri (female servant to Queen). Though there is no direct reference to this specific name and I have not found anything to validate the origin of this name. But after discussing the name 'Hanyalaurya' with my friend, it could mean one who destroys to create something new and beautiful. The name is made up of two Sanskrit words, hanya which means destroy and laurya (lr) which means earth. Thus, one who destroy things to make a new earth. I think that mala-yudd means mud-wrestling.